Verdict: Just as funny, heartfelt and charming as the first, Mamma Mia! Here We Go Again will have you dancing along from the very start. The cast of Mamma Mia danced back into cinemas this Friday, ten years after the original movie stormed the screens and became the highest grossing live action film musical of all time, only recently surpassed last year by Disney's live action Beauty and The Beast. 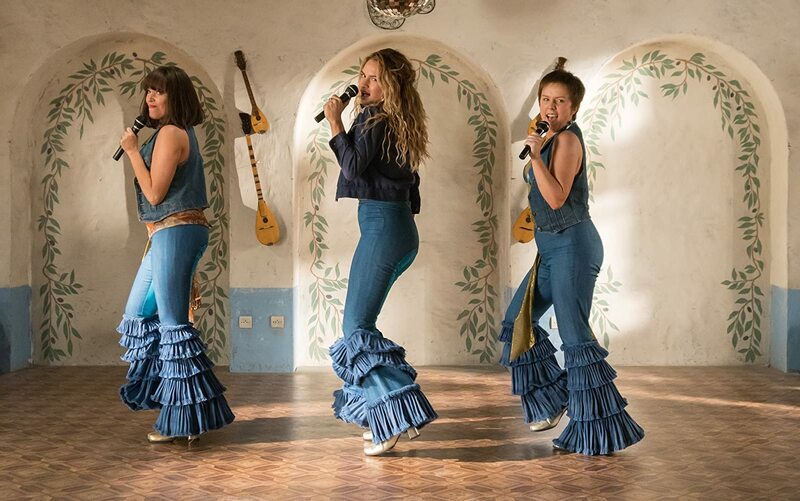 Whilst film musical sequels can be hit or miss, Mamma Mia: Here We Go Again, is packed full of feel good summer fun and will have fans dancing in their seats just as much as the first film did. When a film is as beloved as Mamma Mia, and the wait for a sequel is as long as it has been, it is natural that fans might have some pretty high expectations. Thankfully, Mamma Mia: Here We Go Again is sure to live up to expectations and then some, with the same level of feel good fun as the first film (along with some surprisingly poignant moments). The return of all our favourite cast members from the original and some great new faces in the younger versions of Donna, Rosie, Tanya and Sophie's three possible fathers (yup, we still don't know which one he is, though I maintain my theory that it's Bill). I was a little worried that ABBA's most well known hits had been exhausted with the first film, and that I wouldn't enjoy the soundtrack this time around; but I shouldn't have been, the film features old favourites like 'Dancing Queen' and 'Mamma Mia' alongside great new songs such as 'Why Did It Have To Be Me' and 'When I Kissed The Teacher'. It is clear how much fun the cast had with their performances, and that fun is infectious, making you want to dance right alongside them. The new, younger cast is incredible, all bearing a striking resemblance to their older counterparts (particularly Alexa Davies, who plays the young Rosie), and at times outsing their future selves - not that that was too hard for Jeremy Irvine, given Pierce Brosnan's singing skill! Lily James makes a fantastic young Donna, capturing the essence of Meryl Streep's character perfectly, but with an added youthful, carefree air. Hugh Skinner is suitably awkward as a young Harry, Josh Dylan charms the heck out of every scene he's in as young Bill and Jeremy Irvine, whilst less memorable for me than the other young actors, still puts in a great performance. The younger versions of Rosie and Tanya (Alexa Davies and Jessica Keenan Wynn) add a great level of comic relief to proceedings, whilst also providing a great support system for the young Donna. The plotline is slightly more complex this time with the intertwining past and present timelines, which could have worked out badly; but it works beautifully with past Donna's timeline perfectly fitting with where Sophie is in the present. Wisely, Pierce Brosnan is given much less singing this time around, something which those with ears will be thankful for. Instead, the new cast get the bulk of the songs, a great decision given their singing abilities; some of my favourite performances were the introductory performance of 'When I Kissed The Teacher' at young Donna, Rosie and Tanya's graduation; a riotous romp which was the perfect start to the film and 'Waterloo', which young Donna and young Harry sing on their first date in a Parisian restaurant. The returning cast members still put in great singing performances, with the emotional 'My Love, My Life' and 'I Have Been Waiting For You' being among my favourites. I know the trailers sent everyone into a tailspin about the fate of older Donna, and without wanting to spoil anything, let me reassure fans that Meryl Streep is still a part of the film and you will get to hear her beautiful voice again! I will admit, Cher's performance in the film, while much touted, did feel a lot like just Cher making a cameo rather than her playing a character, but she did have some fantastic one-liners, and her performance of 'Fernando' with Senor Cinfuegos was great. Overall Mamma Mia! Here We Go Again was absolutely everything that I wanted it to be: packed full of amazing musical performances (and the return of the wacky 70s costumes! ), of beautiful, touching moments as well as hilarious ones, and like the first was a great, feel good summer film. Mamma Mia! Here We Go Again is out now, distributed by Universal. What are all these social media security updates about?